A masked thief fired a gun at a clerk Tuesday — missing her — while robbing a Midway-area convenience store, then commandeered a cab and forced the driver to lead officers on a brief pursuit that ended with the suspect’s arrest, police said. 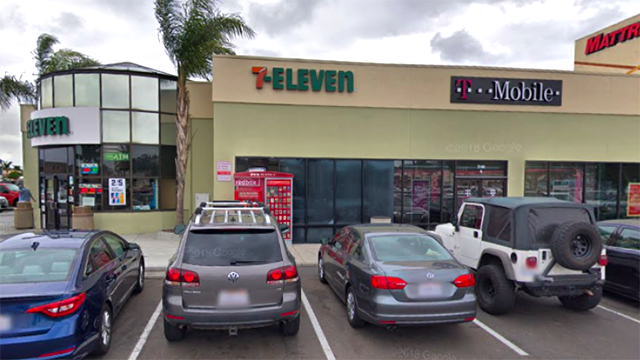 The bandit confronted the employee at the 7-Eleven in the 3100 block of Sports Arena Boulevard shortly before 8 a.m., pointed a handgun at her and demanded money, according to San Diego police Officer Robert Heims. When the worker failed to immediately comply, the robber fired a single shot toward her, Heims said. The terrified but unscathed victim then managed to open the register, he said. After grabbing an undisclosed amount of cash, the thief left the business, got into a taxi that was parked nearby, threatened the cabbie with the gun and ordered him to drive away, according to Lt. Martha Sainz. A short time later, officers responding to the robbery spotted the taxi headed toward Point Loma and tried to pull it over. “The suspect ordered the cab driver to continue south on Rosecrans Street, and a pursuit ensued,” Sainz said. The brief chase ended when the taxi driver had to stop for traffic at Nimitz Boulevard and Harbor Drive. There, officers were able to arrest the suspect, identified as 38-year-old Steven Raymond Stogsdill, without further incident, according to police. Stogsdill was booked into San Diego Central Jail on suspicion of armed robbery and kidnapping. He was being held without bail pending arraignment, scheduled for Thursday afternoon.